Ballystrang is the 1171th highest place in Ireland. 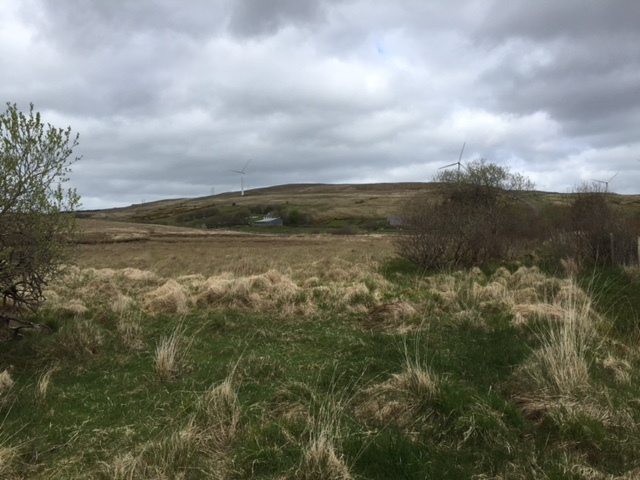 Like its near neighbours Cark Mountain and Culliagh SE Top, Ballystrang is an unassuming hill granted dubious character by an extensive adornment of wind turbines. An ascent is very straightforward and quickly accomplished. Park at the foot of a windfarm access track at C10914 04534 A, where there is adequate space. Climb over the fence by the side of the gate on the left (stones left here to facilitate the manoeuvre). Climb up the road for a few hundred metres to a turn on the left (signposted to turbines 37 and 38). Follow this turn for another few hundred metres to turbine 38; here turn right and follow an overgrown low stone dyke up an easy grass slope to the summit.